Thunder gods' gold! 1953. This work joins Thunder Gods Gold with Practical Prospecting. Content and organization of material follow the model set by the second printing, 1946, inserting the additional material from Practical Prospecting into Part IV as three new chapters. Storm being Storm, there are numerous changes to report for 1953. These are the most easily spotted: there is a new title on the title page, with the addition of the apostrophe to Gods' and the exclamation point at the end, a change not noted on the dust jacket, though the apostrophe does find its way to the book's spine; the Foreword of the second printing, 1946, is dropped and an Epilogue again appears in Part III right where it did in the first printing of 1945, but its content is different, only the last three paragraphs echo the old Epilogue/Foreword of 1945/46; new Prologues to Parts II, III, and IV; all the photographs are now gathered together in three chapters, the old Golden Trails, and the two new chapters added to Part II, Treasure Hunting Country and Lost Mine Prospecting; and the overall dimensions of the book are smaller, one half inch shorter and narrower. More difficult to spot changes abound, so I will mention only two. One that is fun is the typo in the table of contents where Part IV chapter 6 is spelled Field Trip Dairy. It is spelled correctly on the page in chapter six, the last numbered page, which is left blank for the reader's notes. Not so amusing is what happens to the old Part IV, Notes of Authenticity, now called Notes and Credits. The new Notes and Credits section is a truncated version of the extensive notes section found in both printings of the first edition - it is inferior. It would be a shock to find that Storm didn't edit and rewrite the text. There are too many small instances to bother with but I will note that there are major changes to In Treasureland, some chapters in Part II, and to Part III, Hidden Spanish Gold, which is heavily reworked. A few more odds and ends. The quotation at the start of Part II is new as is the one for Part III. The latter is a poem by Storm, the same one I quote in my notes on Tales of the Southwest. The title and copyright pages are all new with a wealth of helpful publishing information presented. I also want to point to what appears to me to be a shift in the style and sentiment expressed in Storm's writing between 1946 and 1953. By 1953 Storm visibly appears to be toning down his lively purple-prose style, typically in full flower in the first edition of Thunder Gods Gold. He also reveals in his new remarks and editorial changes a man who seems more philosophical about his chances of finding his long sought treasure trove and considerably less misanthropic. An older and wiser Barry Storm? A couple of examples. First edition: "Thunder gods' gold is still there - and perhaps one day I'll find it. But now your chance is as good as mine." New edition: "The gods' gold is still there - and from the evidence turned up since, obviously in more than one cache or as yet ungutted mine. But of finding it all?...ah, that is the dream that never dies." But he remains optimistic. The old Storm: "...ever since the day Jason set sail after his Golden Fleece treasure trove has always been the fabulous touchstone of Desire, the eternal dream of personal Destiny, the wish-fulfillment of Vanity, the muted hope of tremendous Achievement at one bold stroke." The new: "...ever since the day Jason set sail after his Golden Fleece treasure trove has always been the fabulous touchstone of desire, the eternal dream of personal Destiny, the wish-fulfillment of Vanity, the muted hope of tremendous Achievement at one bold stroke. And a stroke that has many times succeeded!" Most telling is his omission of all the old heated rhetoric about "...unthinking human masses who steal the labors of individualistic people by sheer practical weight of numbers" or "...the lure of adventurous achievement which drew the self-sufficient, individualistic men of the flaming times of the Spanish and Western American conquests into hazardous, irrational deeds by our sophisticated standards but only because of essential motivations and human characteristics which are now fast ceasing to exist in the modern, group-controlled quagmire of cattle-like human herds." A more mellow or philosophical Storm is all the more surprising to find in 1953 considering his recent unhappy experience with Hollywood. That he took a kinder view of his fellow man after, in his view, the infamously misleading and propagandistic (i.e. "Communist") film Lust for Gold is to his credit. 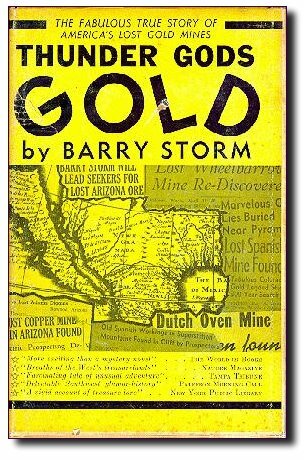 Storm's No Credit page at the end of this book about the Lust for Gold fiasco is a '50s relics just too good to be true. Wonderful. 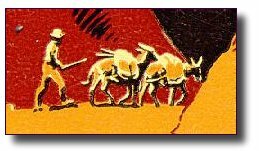 For much more see my notes on I Was Swindled by Red Movie Makers, 1954 and Thunder Gods' Gold: The Mountains That Were God, 1967.